Happy Friday everybody! 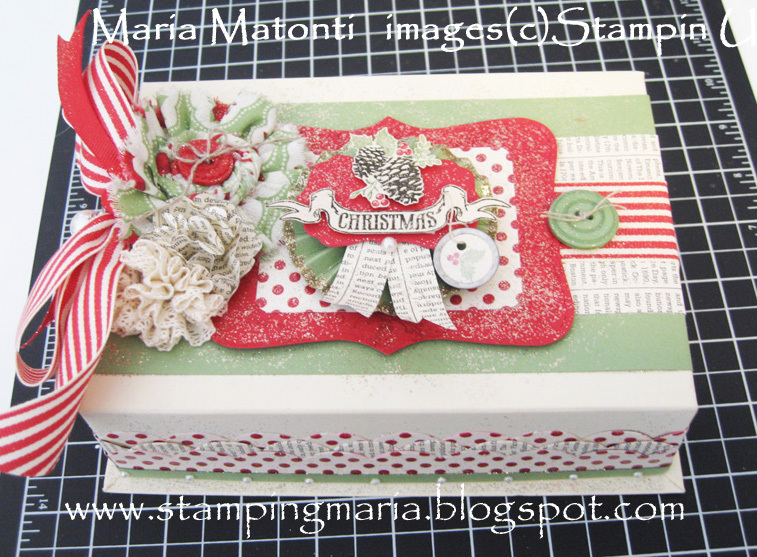 I'm getting ready for my Christmas Keepsake Box Class so I thought I'd show you a picture of the finished product. This box and all the accessories to make it are on SALE on the Stampin' Up Clearance Rack HERE. For only $11.97, you get the box, a whole pack of Pearls, a whole container of glitter, a Pearl Bauble, and precut ribbon, paper, and fabric!! The box is about 5"x7" and makes a beautiful gift! My customers wanted to have the class early to get a real big jump on Christmas gifts! Have a great weekend and contact me if you'd like to preorder your 2012-2013 Annual Catalog! PS: I made some corrections to the supplies I used on the Mother's Day card I posted Wednesday, so if you plan on making one like it you may want to click over to my blog and take another look!